Imagine! The western monotheistic world worships all these gods – never mind the contradiction in monotheistic – and variations of gods – the Jewish god, the Muslim god, the variety and shades of Christian gods, stretching from the god substitute in Rome, to the reformist gods of Calvins, Luthers, Zwinglis, and of course, the god of the Freemasons – and surely many more –but none of them gods has the stomach, the courage in fact – to scream murder for what Israel has been doing to the Palestinians for the last 70 years no end. None. They are all silenced in awe. Let alone the people who follow these gods. They pray to them, they go to their masses and churches – all begging for the good of their souls – not even realizing that long ago – ages ago, centuries ago, they have seized having souls. Their emptiness is yawning. Yawning – so big, it’s gotten dark – a darkness ready to swallow the world, the western world that is, because only the western world has all these powerful gods. And all these gods are gods of love and compassion. Imagine – a god of love that doesn’t dare telling his or her disciples and followers to stop hating, to stop killing, to love each other. Are they hypocrites, or just don’t have the guts to stand up and scream? – Aren’t they Almighties with endless powers inspired by endless love, by the godly spirit that is supposedly in all of us? This godly spirit that allegedly besets us all, is killing helpless and unarmed, Palestinians, oppressed and raped for decades, deprived of their dignity and human rights, living in abject misery. Palestinians are slaughtered every day – 17 the other day, a real massacre of Palestinians. Where are the gods? They shut up. Do they even realize that they have the power, the godly power, to holler and yell – and shout for Love and Peace? For stopping the killing? Where are the gods that watch over Palestine? – Are they all sitting in armchairs, above the clouds, zipping beer and watching CNN, BBC, CNBC, DW et all… reporting on the love played out on mother earth, by the gods’ disciples. Haven’t they noticed, these gods, are they too blind from comfort to see that love, their love, is running amok, that their disciples have forgotten what love is – the very love that is supposed to be guiding us all, since we all are part of you gods? Gods wake up! – Palestine cannot wait. Palestine is being murdered, every day a little bit. And you, gods, say nothing. Your silence is assassination. Your silence – dear gods, disqualifies you from godliness. You don’t want that. You don’t want to lose the power of love and let evil reign. Do you? If only one of you powerful gods would stand up, rise up and stand above Palestine with a fist full of roses screaming and yelling so loud that Israel would shrink back into the space they were graciously allocated out of love by you gods, that they would respect the lives of others, these Zionist-Israelis and all these AngloZionists and their vassals, that they would respect the voice of love, the voice that rules their gods’ kingdoms. Just one god must have the courage to stand up with all his might and shout, NO! – But no, there is no such god. Do we finally resign ourselves to recognize, that there is no god, that they are all fakes, that they are all excuses for us to keep murdering in the name of god, yes in the name of god, because all we ever do by worshipping is promising that we follow the ways of god, gods word, that we will love as god demands – but god never speaks. So, where is he gone? Where is our protector, the protector also of Palestine, our father in heaven, to whom we pray to give us peace, every day we pray for peace and love? Where is he? Yet, the merciful god, never stands up to defend the rights of the powerless, those that have been deprived of their very right to live a decent live. Palestine – you are loved in silence, by gods that have no voice, by gods that have no guts, by-god! by gods that have no soul. One asks, do they even exist, these gods of silence? 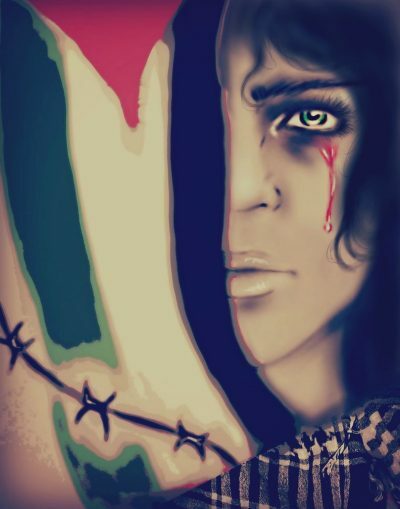 Palestine your heart wrenching suffering is watched day by day by all these gods, and not one takes his power in his hands, heaves it above his head and shows the world that he IS god, because he knows what justice and love means – and he protects you – Palestine. Palestine, you are on your own. There is no god to protect you, to bring justice to your people, Palestine – there is no god. Period. You live in a godless, loveless world, devoid of justice. Palestine, until we, the fake disciples of fake gods wake up to our soullessness and go searching for the lost spirit, the conscience that went floating away with our souls following greed and lust – until then, Palestine, you are alone. And only YOUR love for each other and YOUR soul which you haven’t lost will salvage you. Little by little, some men and women of this godless world, will realize that the only god that has power is the god that lives – again – in us, if we allow him the space that he had when we were born. Only then, Palestine, with these men and women, who are willing to awaken to this dire reality, will you find solidarity and voices that dare to shout and to act as they shout – and bring re-birth to Love – the LOVE and PEACE you deserve, dear Palestine. Featured image is from The HyperTexts.